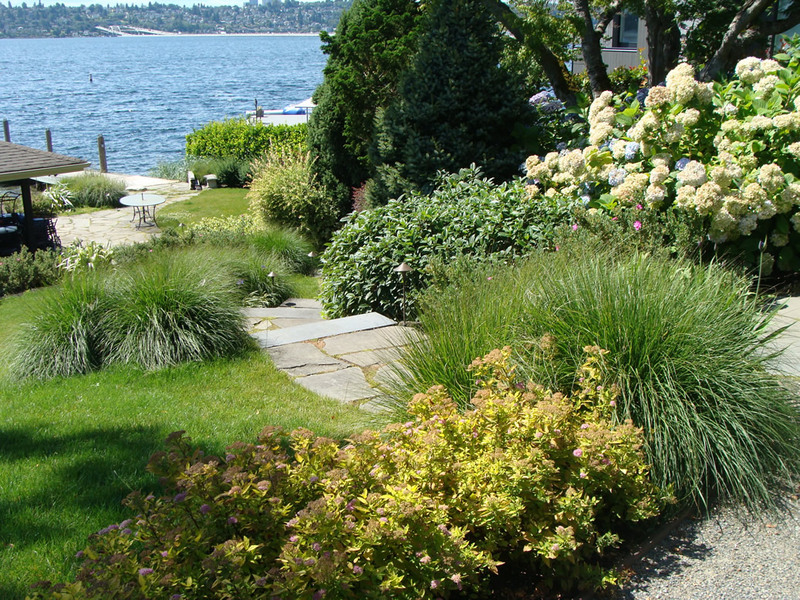 Seattle Landscape Architect Brooks Kolb was pleased to have the opportunity to design this sunny garden on the west Mercer Island waterfront for an active family who love boating and fishing. 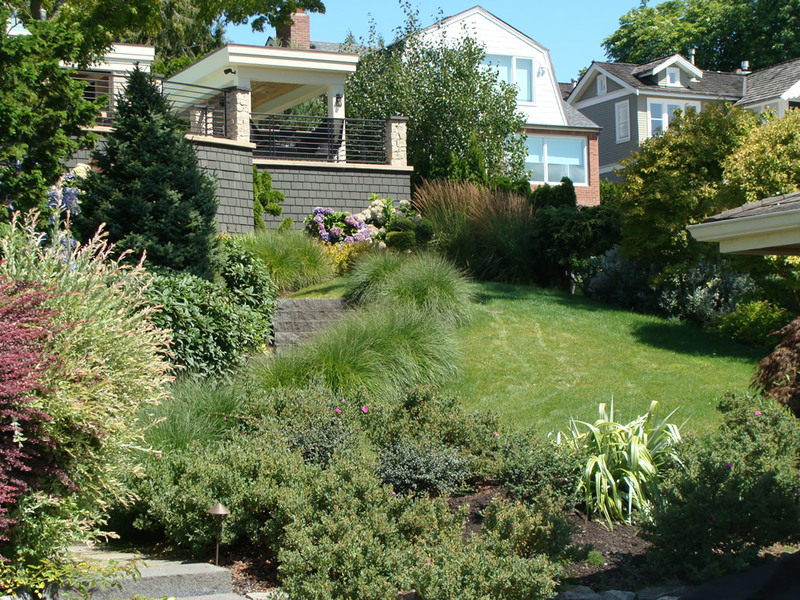 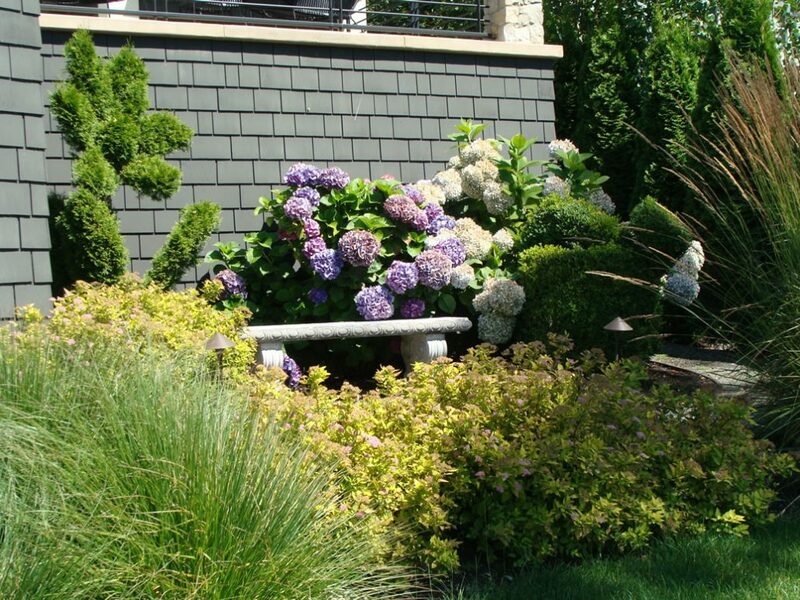 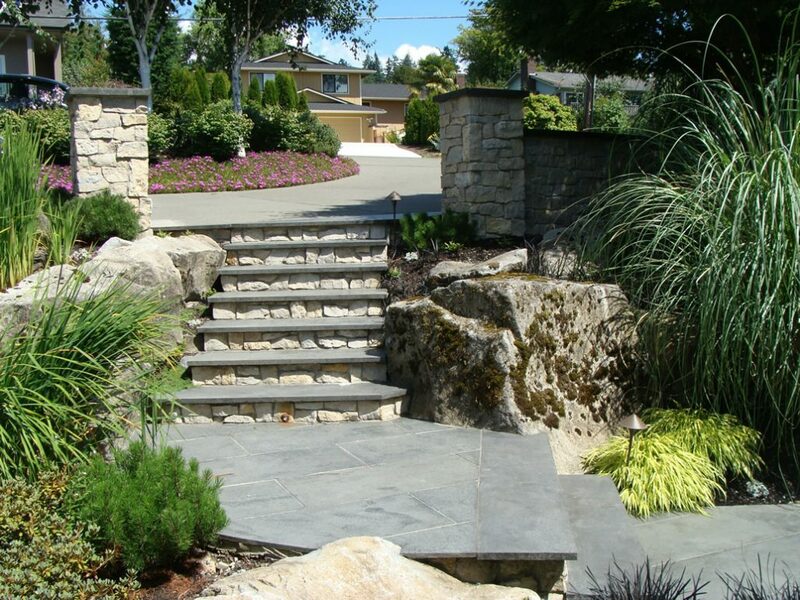 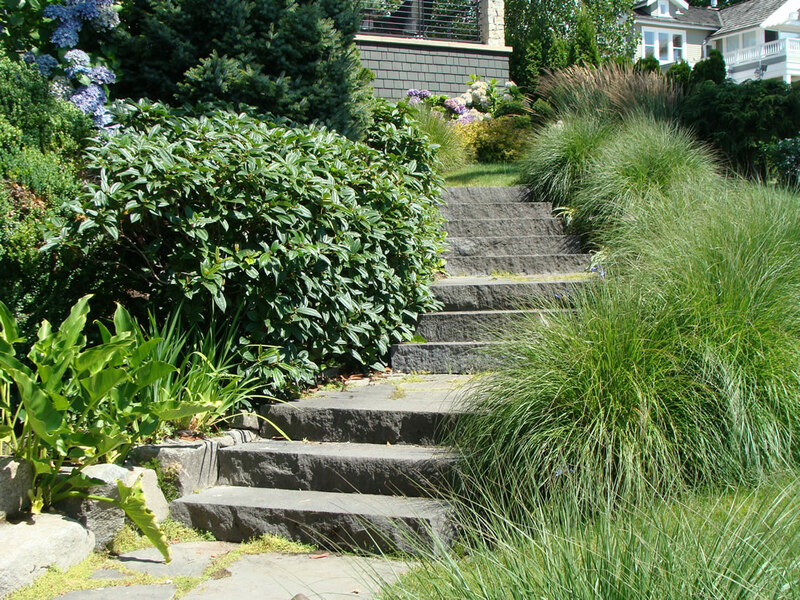 The small front garden was designed to embrace dense and diverse, existing mature plantings surrounding a remnant rock waterfall, which was re-envisioned as a dry creek bed. 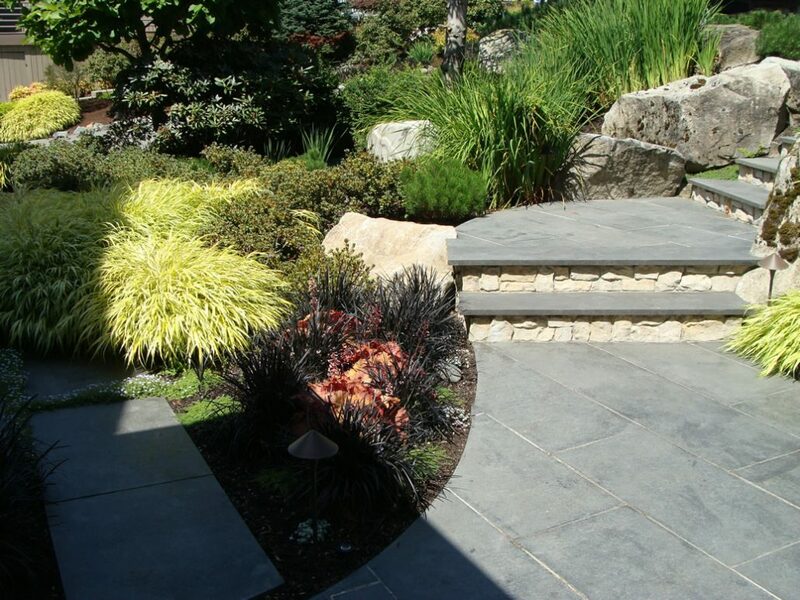 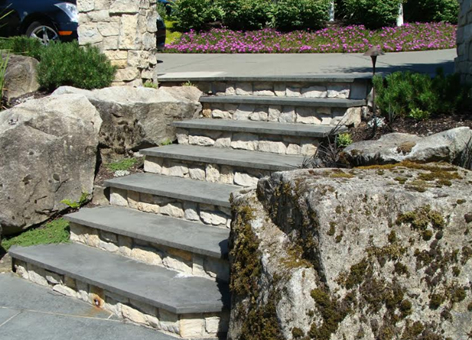 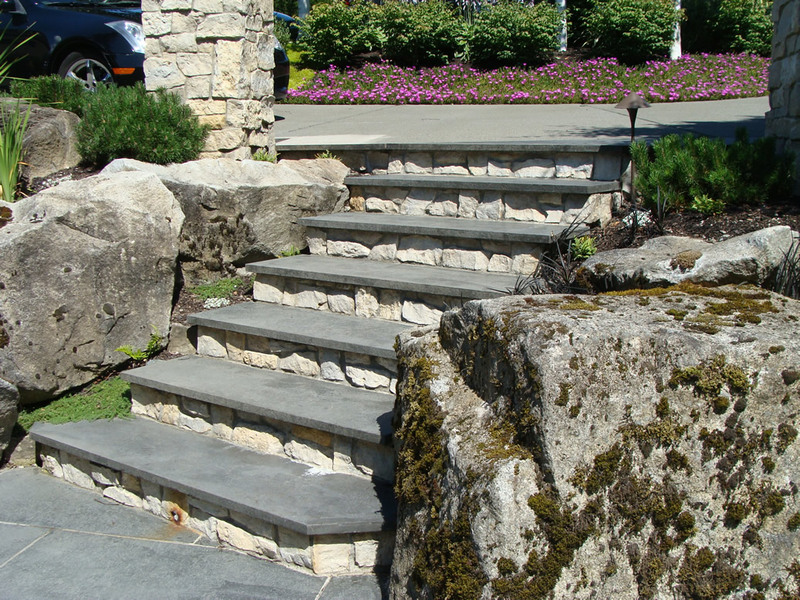 A low site wall of blond Siena Stone greets visitors at the U-shaped entry drive, from which black basalt steps descend to the front entry. 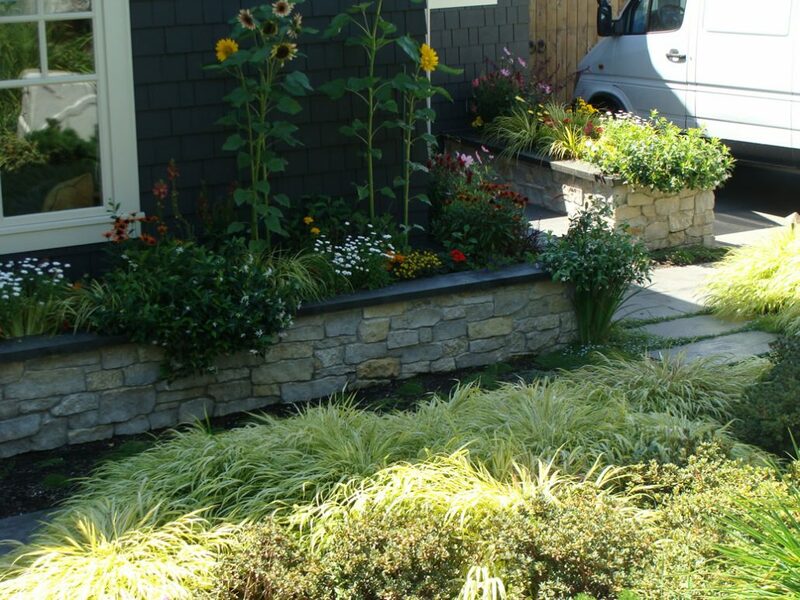 New plantings feature bright purple Hardy Ice Plant and Gold-Variegated Japanese Forest Grass. 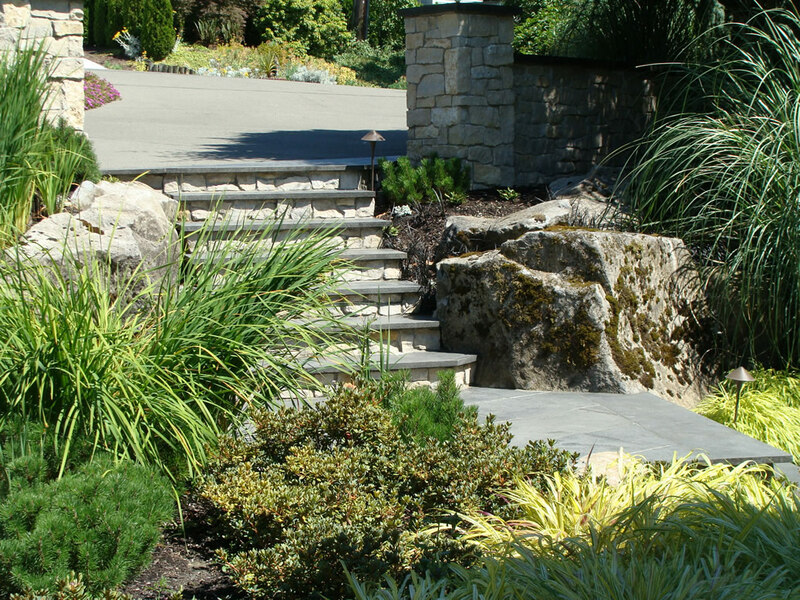 Behind the house is the main outdoor amenity: an elevated swimming pool terrace and outdoor kitchen designed by architect Brad Sturman. 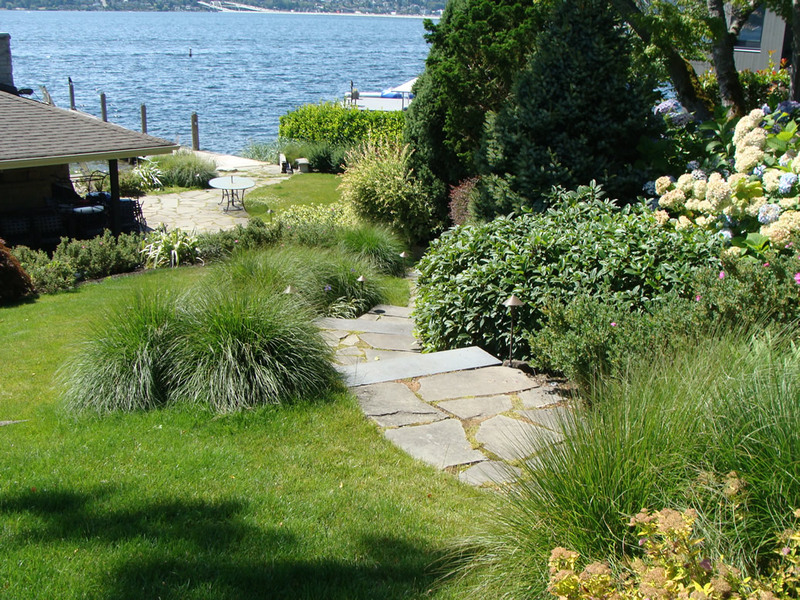 From the pool terrace, new landscape paths descend to the back garden, where solid black basalt steps curve past a new lawn on their descent to a bluestone terrace next to the waterfront guest house, beach and dock. 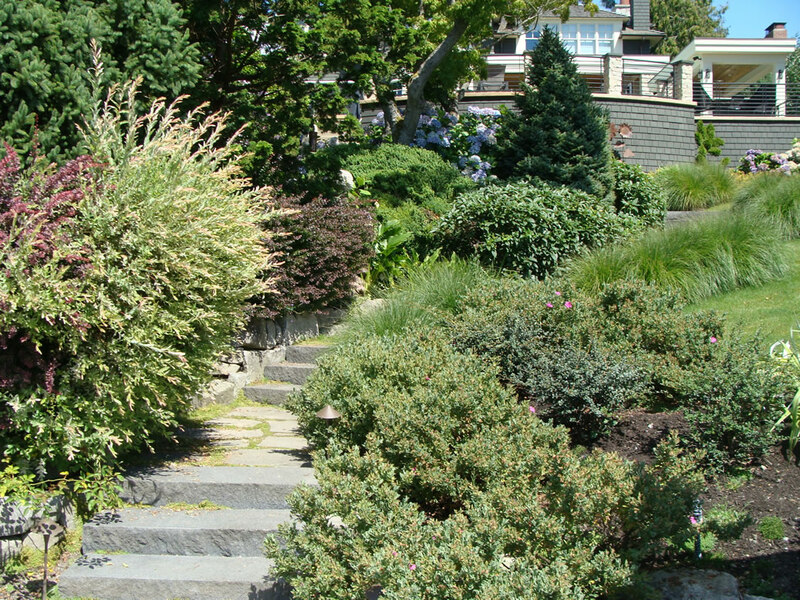 In the summertime, the lower terrace and guest house are at the center of family fun. 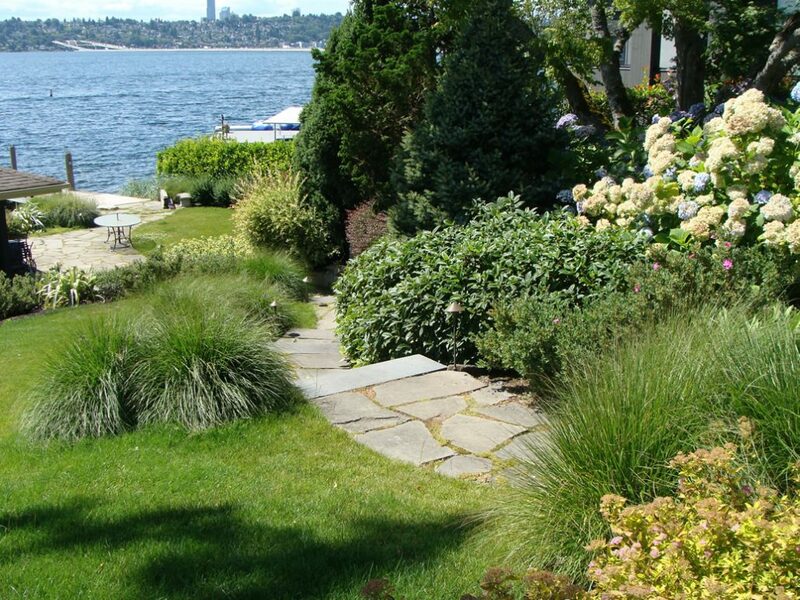 For Brooks the main challenge in the back garden design was to preserve, re-locate and transplant a number of existing large shrubs and small trees that had been dug up and set out in a veritable nursery, filling the space now occupied by the lawn and almost blocking views of the lake. 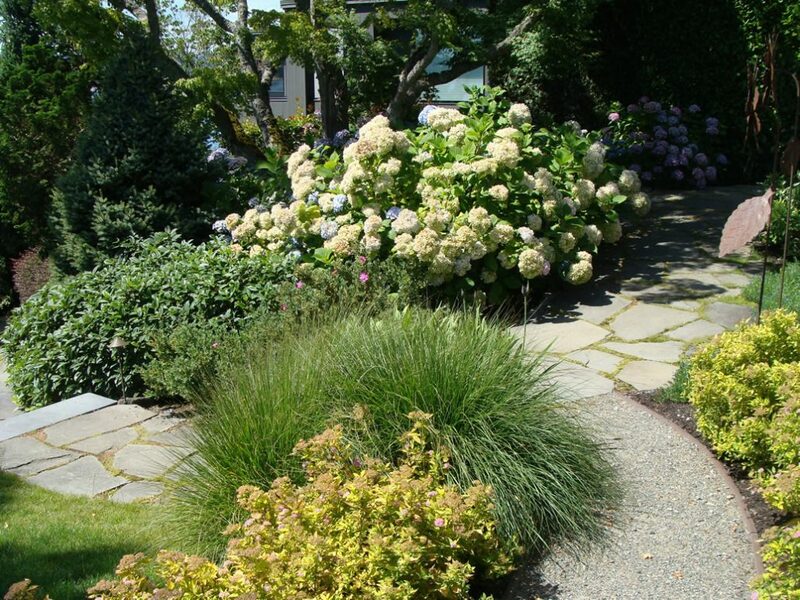 The new planting design emphasizes ornamental grasses evoking the feeling of being at the beach, together with new and existing Hydrangea shrubs in many hues, under the umbrella canopy of a tall and venerable Japanese Maple. 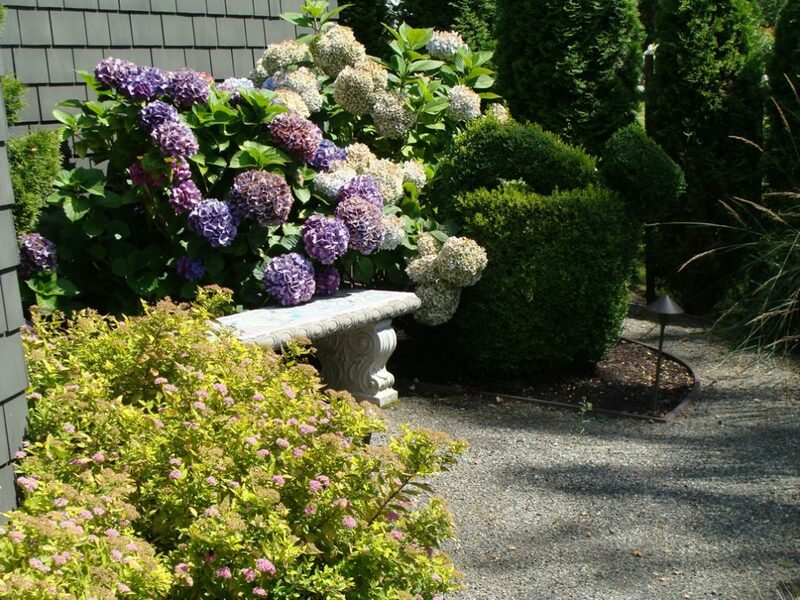 The owner’s wit and love of garden ornament extended to working closely with her to achieve the best placement for topiary pieces including a giant flower and watering can as well as a number of tall, metal sunflower sculptures.